With Koudou dropping out of the picture earlier than I expected and Kazama intent on settling his score with Hijikata, the possibility of this series ending on a promising note looked rather bleak. In addition, the series has been faithfully adapting the Shinsengumi’s historic events up until now, so Hijikata’s fate looked like it was more or less guaranteed. Continue Reading "Hakuouki Hekketsuroku – 22 (END)"
Progression-wise, the continuation of the Hakuouki story has been good, but has yet to struck an emotional chord with me like the finale did in the first season. That is, until this episode, which was undoubtedly the most powerful one to date. What’s even better is that it was full of good twists — ones that no understanding of history could have foreseen. Continue Reading "Hakuouki Hekketsuroku – 20, 21"
The Shinsengumi casualties are piling up one after another as the Bakufu continues to fight a losing war against the New Government forces. It’s admittedly a bit depressing at this point as the story approaches its inevitable conclusion, but I’m completely caught up in the depiction of their final hours both fictionally and non-fictionally. Continue Reading "Hakuouki Hekketsuroku – 18, 19"
Following the revelation of Koudou’s demon revival plans and the departure of Nagakura and Harada, the situation only gets worse for the Shinsengumi. Amagiri explains to Saitou that Rasetsu destroy themselves by expending all their life energy over a short period of time, prompting Hijikata to forbid the further use of Ochimizu to expand their secret unit. Continue Reading "Hakuouki Hekketsuroku – 16, 17"
Continue Reading "Hakuouki Hekketsuroku – 14, 15"
I’ve been wondering what’s up with the Western-style clothing. 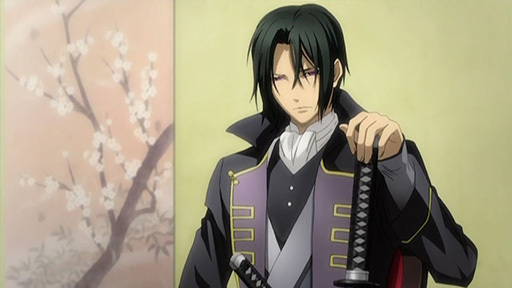 Hijikata gives the Shinsengumi these clothes as an alternative to Japanese ones. He cut his hair too! As I’ve briefly mentioned, Hakuouki is now considered a Monday show in light of AT-X airing a double-header when every other station only aired the recap special. That kind of handcuffs me blogging-wise, but the struggles of the Shinsengumi in their losing fight against pro-Imperial forces has me excited about the direction of this sequel. 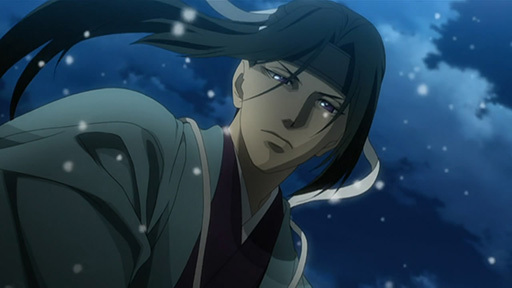 Continue Reading "Hakuouki Hekketsuroku – 13"
Vice-Commander of the Shinsengumi, Hijikata Toshizou (Miki Shinichirou). * Note: I just realized the actual episode 13 aired right after on AT-X on Monday. I’ll cover it in the upcoming days. Consider this a season one primer. Continue Reading "Hakuouki Hekketsuroku – Special"
Being based on a female romance adventure game, Hakuouki is one of the series I knew the least about coming into its premiere episode, but may just prove to be a dark horse this season. Continue Reading "Hakuouki – 01"